A superb, aqueous, deep-penetrating sealer and primer based on an ultrafine hydrosol acrylic emulsion with excellent alkali resistance and adhesion to masonry surfaces. Used for stabilizing and bonding exterior and interior masonry and cement surfaces prior to application of masonry paint, Antimould coatings or other decorative coatings. Reduces porosity and provides a well-bound durable base. Ideal for exterior or interior chalky or porous, but structurally sound surfaces, prior to application of masonry or decorative aqueous paints. Ideal as an aqueous sealer for plasterboard. Brush: Apply one or two coats direct. Roller: Apply one or two coats direct. Conventional Spray: Do not thin. Use 30-40psi pressure and 1.8 mm diameter nozzle. Airless Spray: Do not thin. Use 0.33-0.43mm tip 50-65° angle and 2000psi pressure. Air Assisted Airless Spray: Do not thin. Use 1000-1500psi pressure and 1.8mm diameter nozzle. Specialties Limited. The user must observe local health, safety and environmental regulations when using this product. Consult Advanced Chemical Specialties Limited if there are any concerns over the suitability of this product. PROTECT FROM FROST AND STORE ABOVE 5ºC. ENSURE STRICT STOCK ROTATION IS PRACTISED. Do not apply in cold or damp conditions (i.e. below 5°C or if there is a likelihood of rain, fog or frost). Preparation Ensure surfaces are clean, dry and free from dirt, grease and other contamination. ~ Scrape back unsound areas and repair. 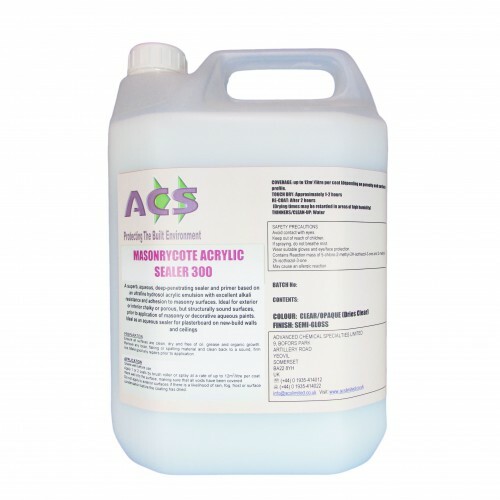 ~ Treat any algal or fungal growth with ACS Mould Wash Concentrate. ~ Highly chalky and friable surfaces should be correctly treated with Masonrycote Rubberised Sealer. ~ Apply one or two full coats and allow to dry before applying chosen finish. Application Mixing: Ready for use. ~ Thinners: Not required. ~ Brush: Apply one or two coats direct. ~ Roller: Apply one or two coats direct. ~ Conventional Spray: Do not thin and use 30-40psi pressure and 1.8 mm diameter nozzle. ~ Airless Spray: Do not thin and use 0.33-0.43mm tip 50-65° angle and 2000psi pressure. Air Assisted Airless Spray: Do not thin and use 1000-1500psi pressure and 1.8mm diameter nozzle. ~ Cleaner: Water ~ Cleanup Considerations: All equipment should be cleaned immediately after use with water. It is advisable that equipment should be cleaned/flushed during the course of application, the frequency of which will depend on the volume of material used and timescale over which applied. Ensure all waste materials (including packaging) are disposed of in accordance with local regulations. Limitations of use Do not apply in cold or damp conditions (i.e. below 5°C or if there is a likelihood of rain, fog or frost). Health and Safety This product must be used in accordance with the Material Safety Data Sheet supplied by Advanced Chemical Specialties Limited. The user must observe local health, safety and environmental regulations when using this product. 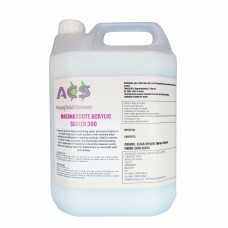 Consult Advanced Chemical Specialties Limited if there are any concerns over the suitability of this product.